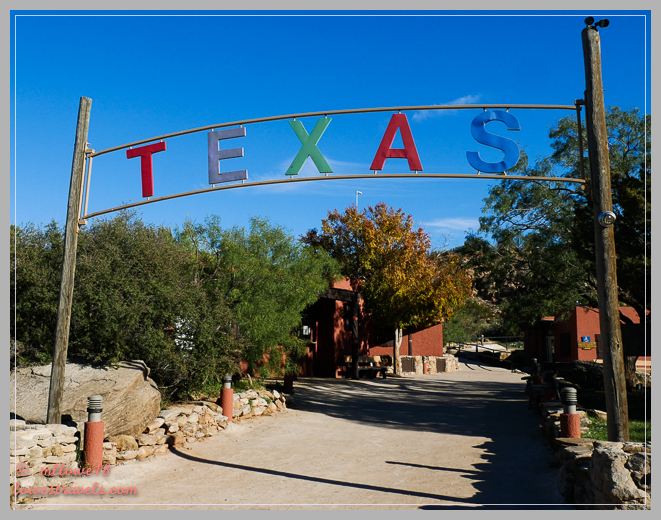 Once out of New Mexico we hastened our pace, stopping only 2-3 days at each destination. They were large cities where we initially didn’t have a lot of activities planned, and the relentless severe weather was seemingly following us across the nation. But as we moved along, each of our stops had things to see and do, which we were able to accomplish between storms. In real time, we’re now on a 10-day break in Savannah, Georgia. I’m blaming the nasty weather for my lack of enthusiasm to blog; it’s just been too darn wet, gloomy and cold for me to get very excited about anything! 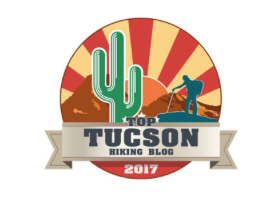 By following I-40 east we were able to check several destinations and points of interest off our “must visit” list. 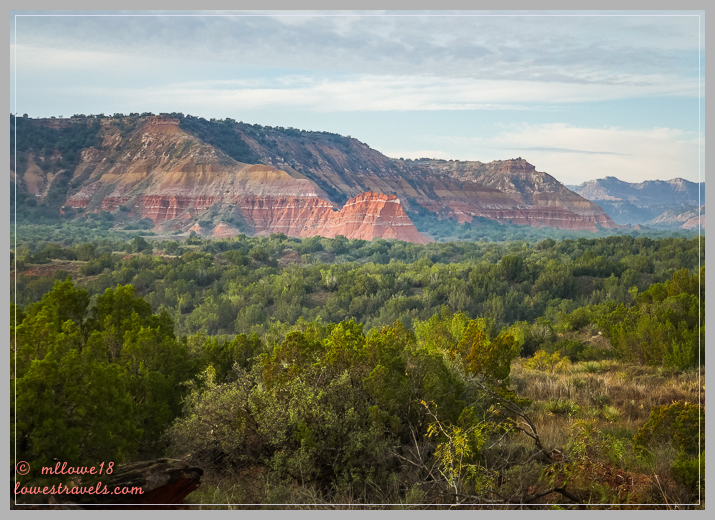 The first one was Palo Duro Canyon near Amarillo, Texas, where we did enjoy some good weather on Oct 21-24. 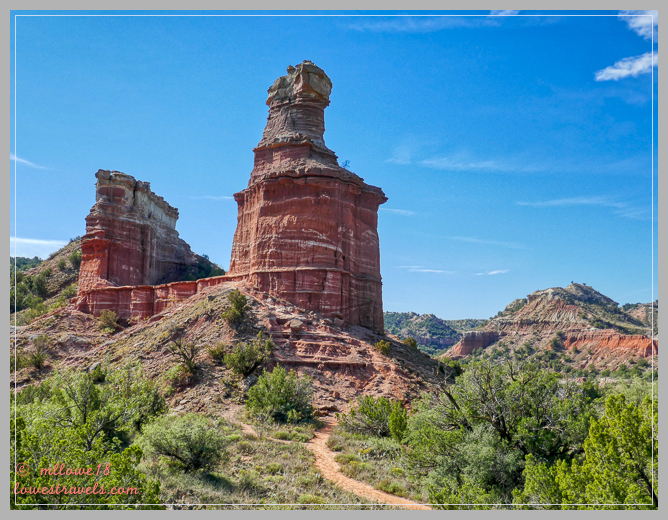 Palo Duro Canyon is the second-largest canyon system in the U.S. (behind the Grand Canyon, of course), but to Texans it’s their grandest canyon. 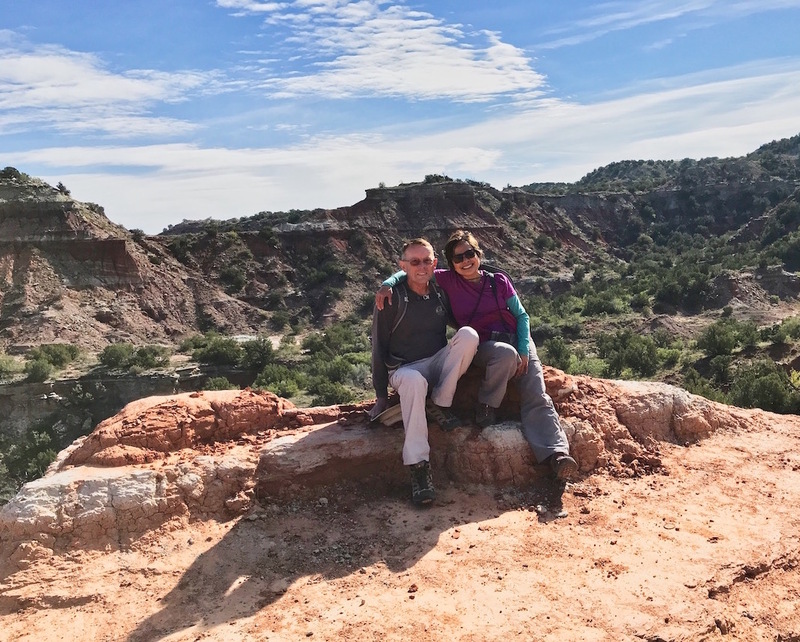 Unlike the Grand Canyon, the floor of Palo Duro is accessible by vehicle, and our campground was located 800′ below the rim – awesome! 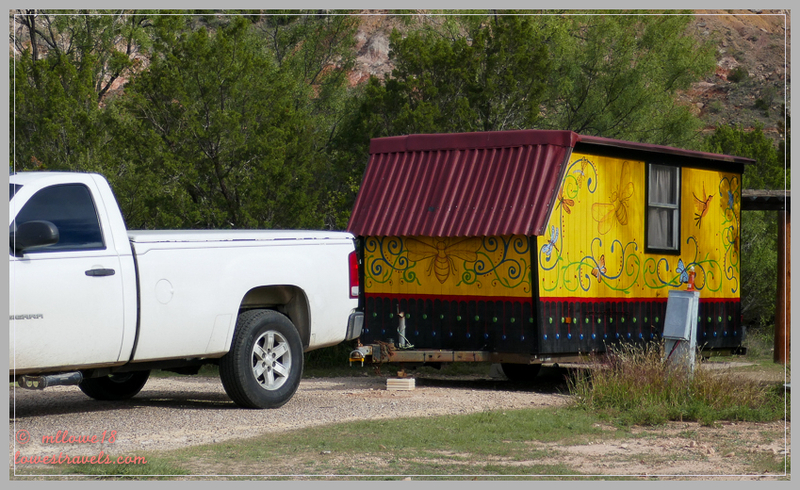 Our campground neighbor – how’s that for a rolling home! Eagle-eyed Steve immediately spotted these critters as we settled in – yikes! 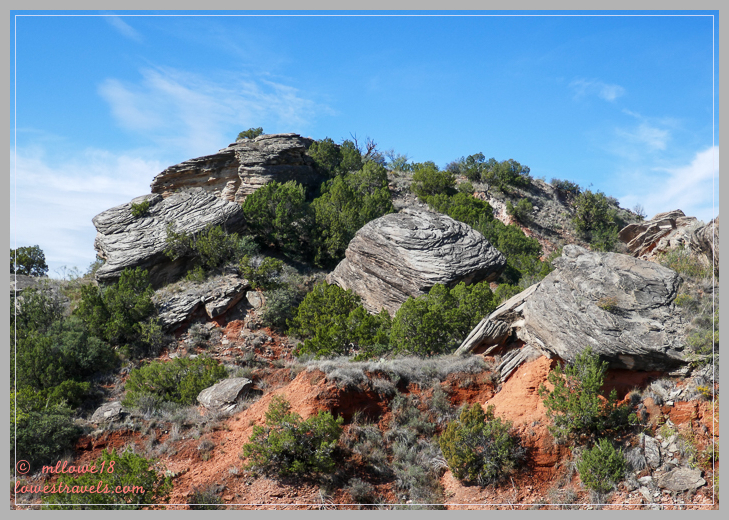 There were several trails available which would get us up close to the multicolored geologic layers of rock. 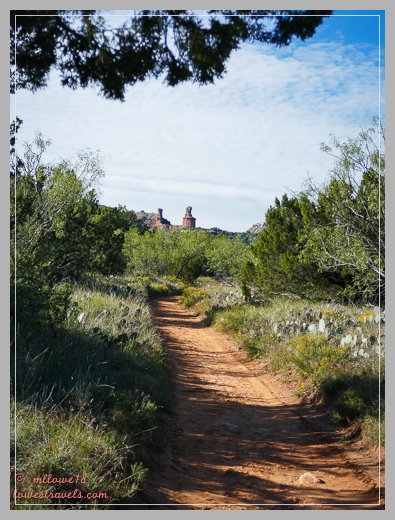 We followed two of them, the 5.5-mile Lighthouse Trail that lead to iconic Lighthouse Rock, and the Givens/Spicer/Lowry Trail which was labeled as a running trail – but we hiked it anyway. 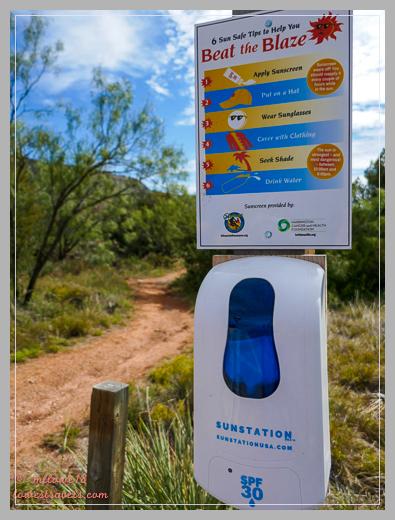 In all of our travels this was the first time we’d seen free sunblock offered at trailheads – very cool! Our favorite hike was the Givens/Spicer/Lowry Trail. It was a moderate 8mi trek that led us close to the layers of bright red, yellow, pink and lavender rock – very scenic and colorful. Ain’t those some striking layers! 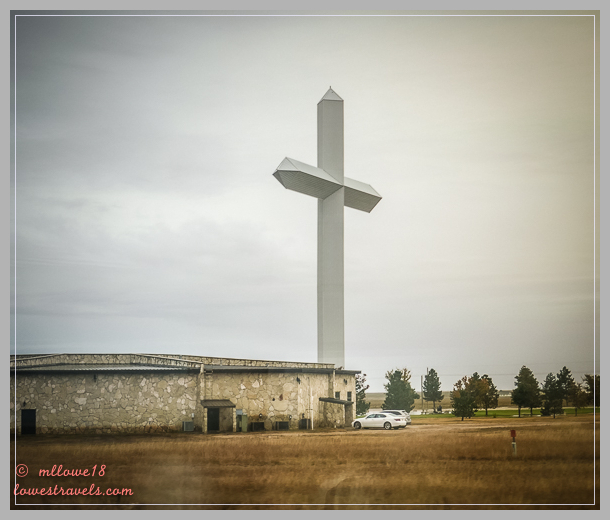 I felt like I was being watched – and yep, I was! 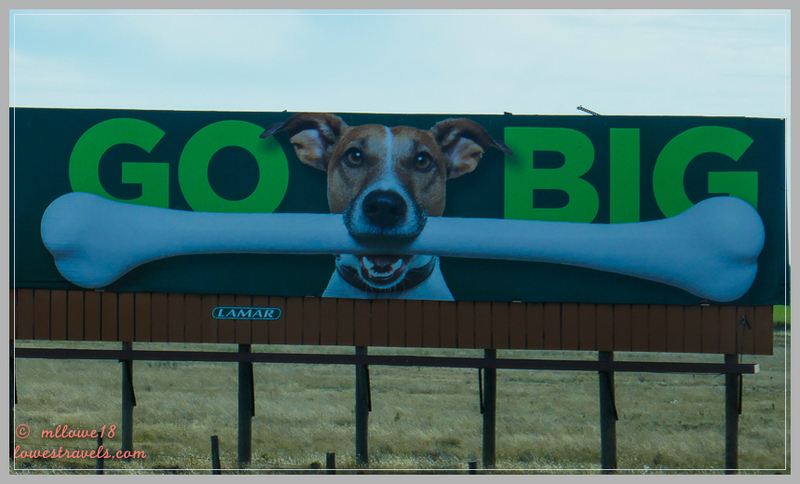 They say everything in Texas is big. 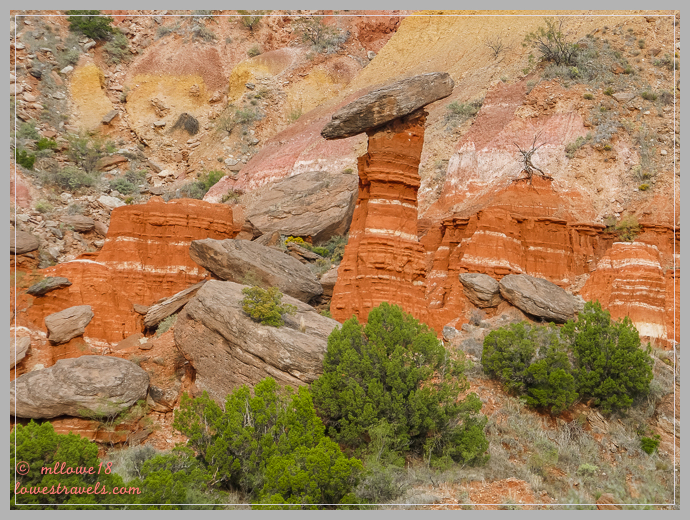 Well, for sure the natural hoodoos in Palo Duro Canyon were gigantic. 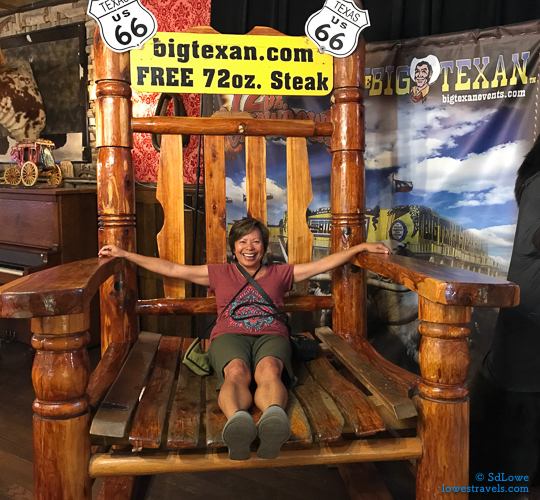 And we saw more evidence of BIG when we drove to Amarillo to get a steak at the Big Texan restaurant. 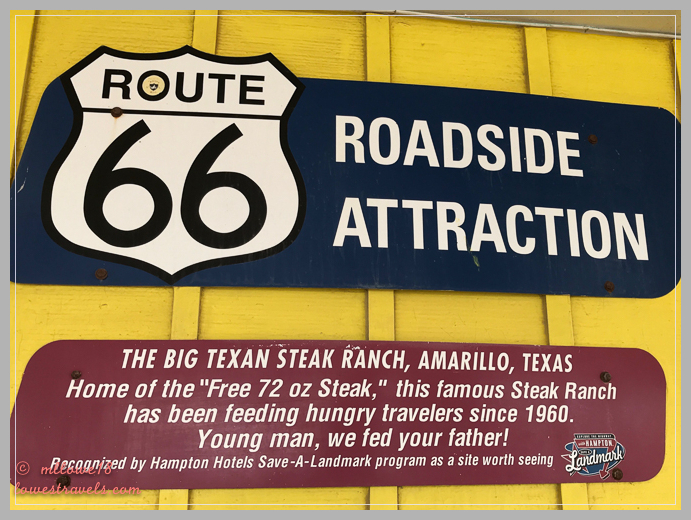 We couldn’t leave here without visiting one of those Route 66 roadside attractions, the “Free 72 oz Steak”! 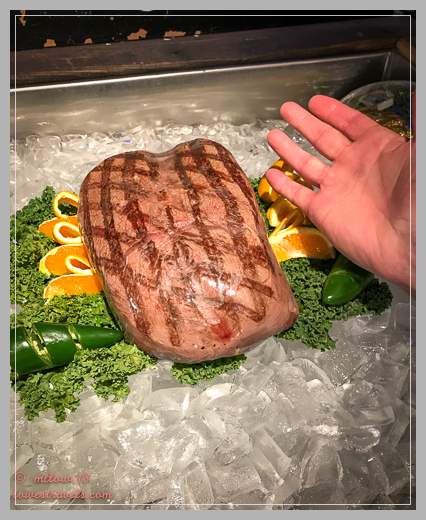 If you can finish this 72 oz steak and all the sides in an hour, it’s free! We chose the more sane – and very good – steaks that are our favorites, and we each made two meals out of them! We weren’t impressed with the environment or service of the restaurant, but there’s no doubt the beef was good. See, no way we could eat them damn steaks in one sitting! 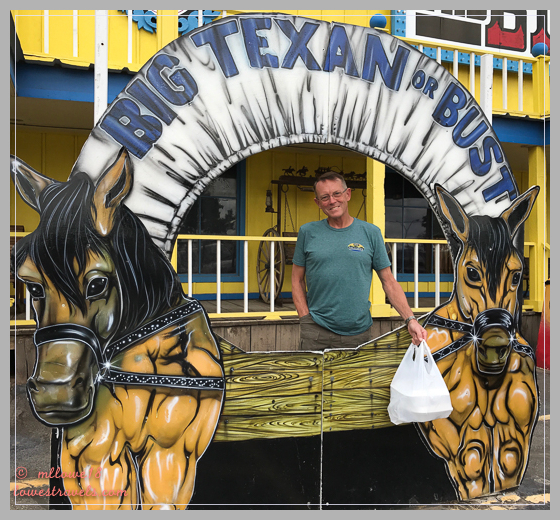 Our only stop in the panhandle of Texas for three days came and went quickly. 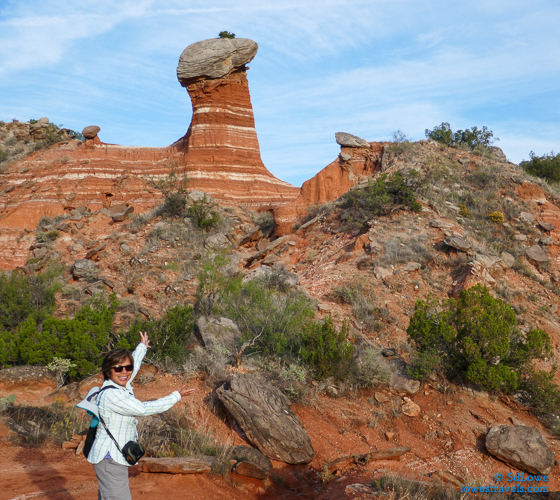 We have seen some of the “big” in Texas and Palo Duro lived up to its monicker – the Grand Canyon of Texas! Next up: Oklahoma City, here we come! With all the beautiful places you have hiked, it will be interesting to see where you settle someday. Once again, great photos MonaLiza! Your photos are beautiful, and the hiking looks interesting, especially the hike to the lighthouse rock. It looks exactly like a lighthouse! Cute photo of you in the big chair, MonaLiza. Maybe that’s made for people who can eat the 72-ounce steak, LOL. 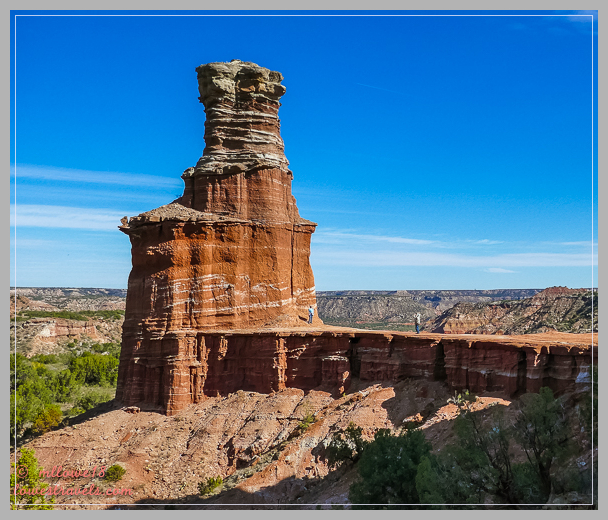 Should your route take you back on I40, Palo Duro will always be a great place for a revisit. Ha ha I think you are right, those big chair are meant for big people with big appetite! We had one fairly decent day that wasn’t 100 degrees for a hike in the park. It was so neat to come upon the canyon after all the flat land. I wish we had seen the lighthouse rock. That is really neat. Love the photo of you and Steve. The Steakhouse isn’t the best atmosphere, but we had great service both times. We both enjoyed our meals and enough for another night, too. Looks like a wonderful visit! 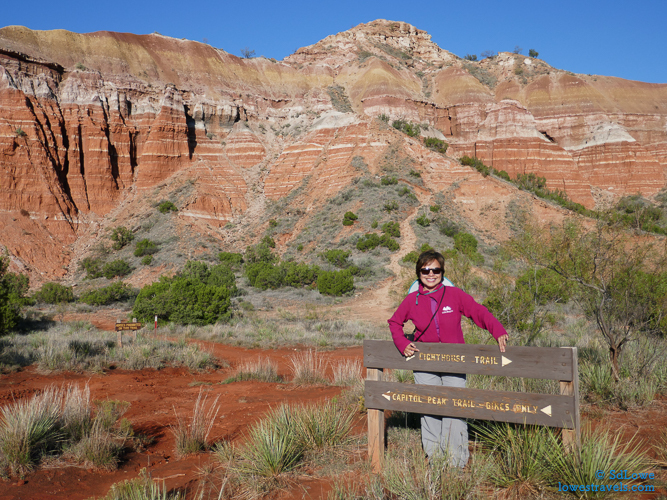 In case you ran out of places to visit or trails to hike, Palo Duro might just be your destination 🙂 Our servers were not friendly, they seem to be there because they need a job. I agree the steak was that good. We still have so much to explore there, Glenda was having foot issues while we were there so never did any of the difficult trails. Looks like the Givens/Spencer/Lowry trail was a great hike. Curt would have been proud to have hiked a trail named after his last name! 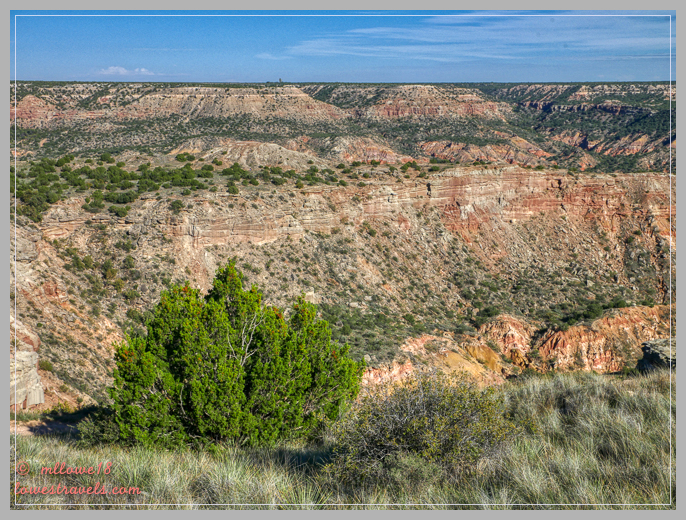 Beautiful pictures of Palo Duro. We really loved being able to stay down in the canyon. We did all the hikes but I had a lot of trouble with the sun and my blue eyes. I burst out laughing at the “cow pies” description. Great shot of you in the BIG chair. Steve did not share what I desribed as cow pies! I’m glad you enjoyed your time in Palo Duro. It’s beauty is truly unexpected! Sorry the weather for the remainder of your trip has been nasty though…..sigh. Thanks to you, we got the same spot you had! Another beautiful place you have visited that we were unfamiliar. Our “go to” list keeps getting bigger. Enjoy Savannah, it is a great town. 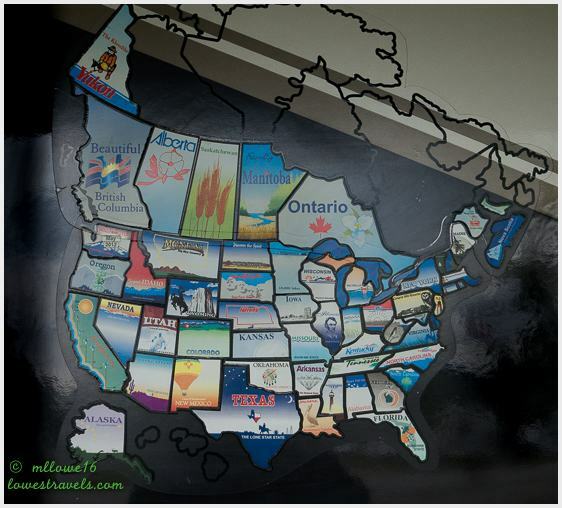 We may have been on the road for several years now, yet our “go to” list seemed increasing instead of decreasing. So much to see in this beautiful country. You were RIGHT BEHIND US! 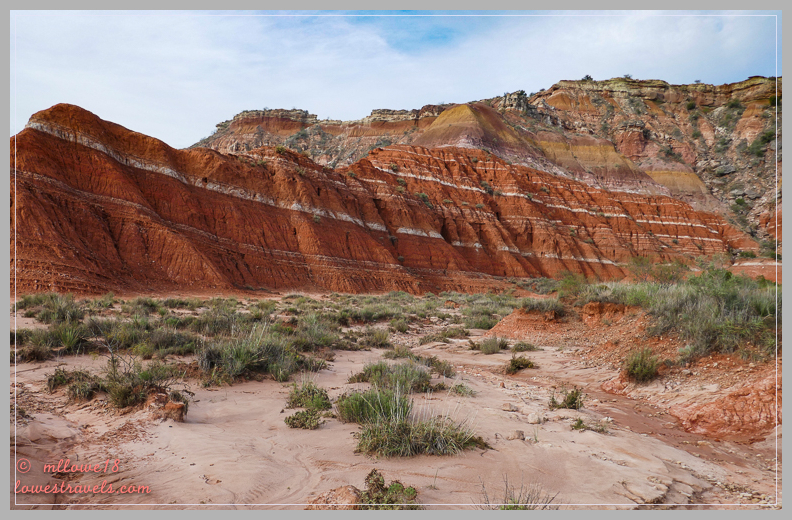 We were there through Oct. 19, then in Caprock Canyons when you were there ( if you’ve not seen Caprock, we liked it even more.) We thought the sunscreen stations were really cool, too. I didn’t get no damn steak, though. Now we all have reason to go back through someday and not miss each other next time! Oh, tsk ..tsk. that would have been nice to meet you! Perhaps Caprock will be for another day. Love the sunscreen at the trailhead! Looks like you found yet another gorgeous landscape to explore! I know, that would really be a big help, especially during summer. There were still trails we wished we had time to follow. 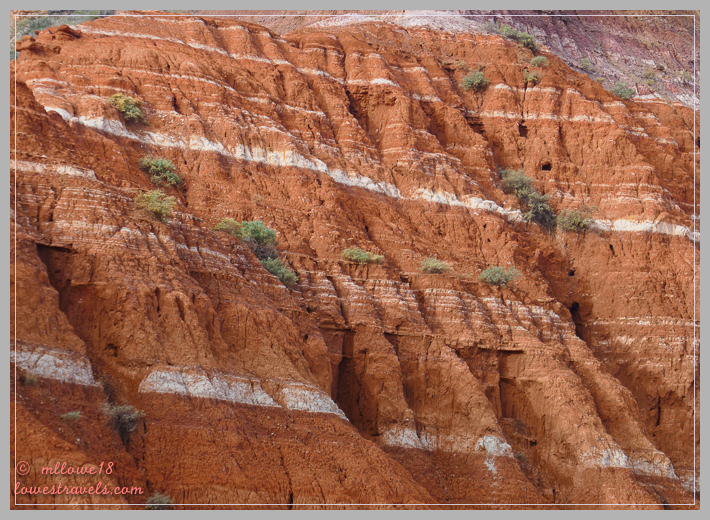 Interesting topography … kind of looks like southern Utah which is unexpected in TX. Hope nicer weather is in your future. looking good you guy! Hope all is well >Gloria is in Mazatland. R and I are batching and at the airport daily! Hope all is well with you guys. 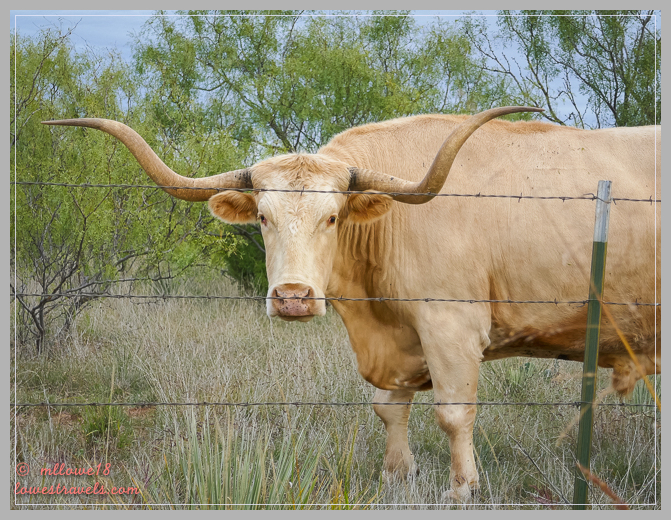 Watch out for all the big things in Texas including the cow pies or the Texas Longhorn pies! It was quite surprising to see layered hills in Texas.